This was my exact concern that I discussed in my post last month about the government having no more bullets left in the barrel to take down this enormous bear who has been eating at the Dow for over a week now. We saw this same trend in October and November. Whenever the market begins to consistently show strong bearish tendencies, it transforms the whole sentiment of the trading world. Almost every article you read is talking about worse times ahead or what the government needs to do to get banks nationalized. In the past, to stop such pessimism, the government usually came in with a very significant announcement to reverse the trend, such as lowering interest rates, discussing new stimulus plans, or the even the event of getting a new president filled with hope. Where we have found ourselves now, is in a point where there is not much more that the government to do or say to make things better that doesn't involve nationalizing companies and wiping out shareholder's equity. Sure they can send out Bernanke, Geithner, or even Obama himself, but the market has recently shown that they are done with the small talk. It's hard to pin the blame on just one person or even one part of the government. I don't know who expected to see this market turn around anytime soon. Back when the stimulus was approved, we all knew that this was a "preservation" stimulus, to help slow the pain getting injected to the economy. This is why everyone was careful to say that the stimulus would create or "maintain" up to 3 million jobs for Americans. The market is becoming very impatient. So, now we are left with a broken down market, with what looks like to have no reason to get better anytime soon, especially when you have auto sales, non farm payroll, and unemployment right around the corner. Unfortunately, this environment makes it very difficult for nature to take its course and we find ourselves in one big ping-pong match from red to green. 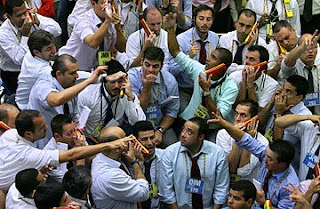 Sure, some daytraders are probably having the time of their life (if they're playing the right bumps! ), but as for me, I am hoping for a bit more normality and conistancy to return to the market. It is not seeing the market continually go down that makes me nervous, but it is the way that the market is doing it which gives me great concern. Almost all technicals have been thrown out the window and anything that can be perceived as good news is quickly trumped with a hard rush of selling. I am amazed at how well the trend of mid day rallying followed by rapid sell off to end the day is holding up. Many investors are increasing their turnover and changing their hold periods from 3 days to 1 or even half a day. Instead of covering their shorts after 3 days, they're doing after half a day. As a result, you pretty much have 2 options in the current conditions; the first is to roll the dice with day trading, which if you roll well, could be very profitable, however very risky at the same time. The second, which is my strategy, hold tight a bit longer until we see some definition come through the market as it always eventually does. It is very obvious that markets are wanting to rally, as we see plenty of green throughout the day. Buyers are just missing that extra wind that they usually would get with government help. A continuing to delay a rally, however, makes the market very dangerous and could set it spinning down hard. So we'll see. I'm keeping an eye on RIMM. Their strength today, despite tough conditions makes me suspicious of upcoming positive news. Under $40, I definitely think they're a steal anyway (in a normal market), so I may jump into some options for RIMM. Anymore down ticking and I'm going to have to eventually consider some shorts again. Maybe FXP due to more and more problems in the Asian markets or even more SKF. If we do indeed rally, SSO is one I would like to take a ride during a bear market rally. So all of these are on my radar. Rimm has a Market Club report score of -70, but has been steadily increasing (get your own symbol analyzed for free, all you need is a name and email, Click Here). So, yes, the patience continues and I am confident that eventually it will payoff. It is times like these where you can loose your shirt if you play the wrong move and playing catch up is never fun. So these next two days are very critical to see if these lows continue to hold and if the S&P stays under 700. I am making money everyday, but the gains are much more moderate than I would have hoped for at this point. My Lending Club investment is performing very well, and still maintains that 10.5% target return on my investment. They are getting more love from the media as well, which has been great and can also be a very good resource for those needing to consolidate there expensive debt. I'll be on chat early in the morning, so with that, have a good night everyone, be careful, Happy Trading and we'll see you tomorrow. Seems like china is up and away with talks of a second bout of stimulus. PMI new orders were back to an expansionary 50.4 thanks to chinese government infrastructure projects. Seems like their first fiscal stimulus expansion has been translated into orders, and while the rest of the world is still suffering from a liquidity shortage, banks in China are lending now. It's obvious the problems in our US economy is very much more severe. 5U Says: March 3, 2009 at 11:26 PM This comment has been removed by the author. Meathead equity traders..the Guy Adami/Pete Najarian types....want that bear market rally. Shorts should wait unitl the close to add unless if new news hits. companies to properly manage their asset-liability management risks. financial markets do not need. for a new standalone GECC. This is a GREAT blog...thanks for sharing! Market Crash of 2009 - Are We Close? 1929 vs 2009 - Are We In A Depression?